With a good knowledge of the Badami Hills, Ganesha knows all the routes, the condition of the bolts, which routes are safe, bolted and anchored. He has climbed most if not all the routes, numerous times. His insight and experience of the rock makes him a great climbing partner. Climbing partner or guide, lead or belay – Ganesha has the qualities and experience to guide you through the Badami Hills. Discover India’s hidden fiery red sandstone crags, a true climber’s mecca for both local and international rock climbers. Welcome to Climbing Badami, here you can find information on Badami and climbing guides for the area. 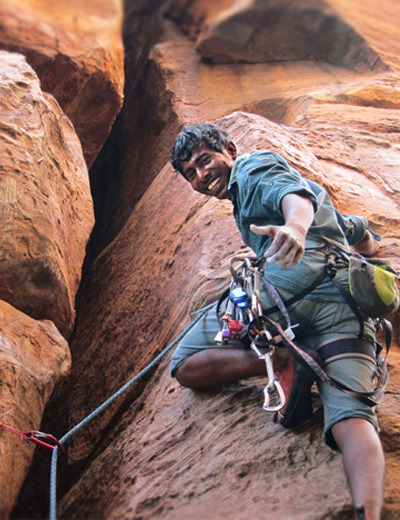 Badami is located 150km North West of Hampi, and is home to some of the best sport climbing in India. 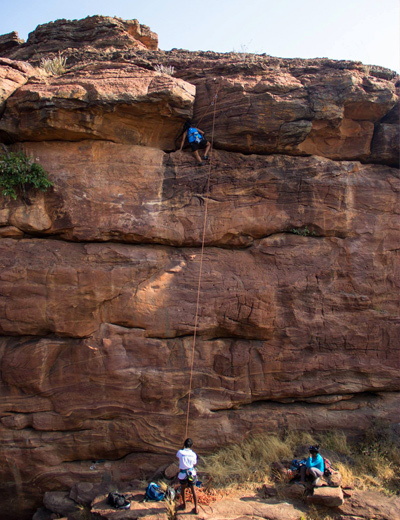 With routes ranging from 5b to 8b+, there is something in Badami for every rock climber, amateur to pro. However, with guide books, a lot of the climbing routes are hidden away amongst the cliffs and temples, we offer our local knowledge and guidance to show you around connecting you with your preferred type of climb. Please head over to the 'About us' page on how to contact us.